Aren't they the cutest couple?!? Hi, and welcome to my lil' Ranma site. I first started obsessing over this anime in the sixth grade, and I haven't stopped since. Even though the series is over, it will always reign as the best anime ever. Good job, Rumiko Takahashi! Bruno's Anime Video Archive He's got all the intros and outros in realvideo format - pretty quoo! Crystal Net Video They have two English music videos compiled by Frank Ho with some of Ranma's best scenes and shots in realvideo format-- this is my favorite site! 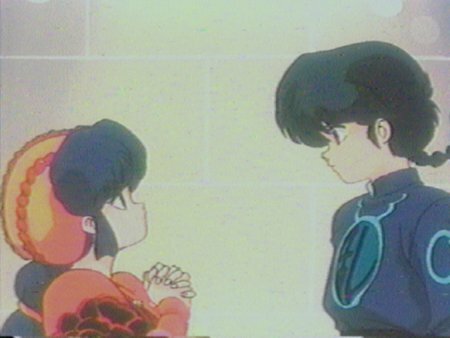 The Ranma and Akane Shrine no matter what people say or will say in the future, I still think Ranma and Akane make the best couple. Face it - they were meant for each other! Lots of goodies & downloadables + an awesome layout! Why Ranma Is Afriad of His Mommie hmmm...wonder why Nodoka is wandering around w/ a deadly kitana? The World of Rumiko Takahashi Get some insight on the maker of Ranma 1/2 - what a brilliant lady! My Ranma 1/2 Image Archive These are my favorite Ranma pix!